With this vulnerability an unauthenticated attacker is potentially able to execute code remotely. This kind of flaw is probably the worst. The good point is that hopefully all ESXi hosts are running in dedicated management networks with access control. If you follow VMwares security best practises, the ESXi management network is only accessible for known administrators. I am aware of the "Most attacks come from the inside" myth and this does not fix the issue, but it reduces the access vector drastically (Imagine the same issue in an internet facing application like a Webserver). Additionally, there is currently no publicly known exploit available for this issue. What is a "Doble Free Flaw"? A double free flaw is programming error where a part of memory that was previously allocated is freed more than once. Unlike to a buffer overflow, where the memory chunck was never valid, a multiple free occurs as a result of a valid instruction being executed in a invalid manner. It's a flaw in OpenSLP which is an open source implementation of the Service Location Protocol. Service Location Protocol (SLP) is a standard protocol that provides a framework to allow networking applications to discover the existence, location, and configuration of networked services in networks. If you do not know the URL to access the WBEM service of the CIMOM on the ESXi machine, or if you do not know the namespace, use SLP to discover the service and the namespace before your client makes a connection to the CIMOM. How is it relevant in ESXi? 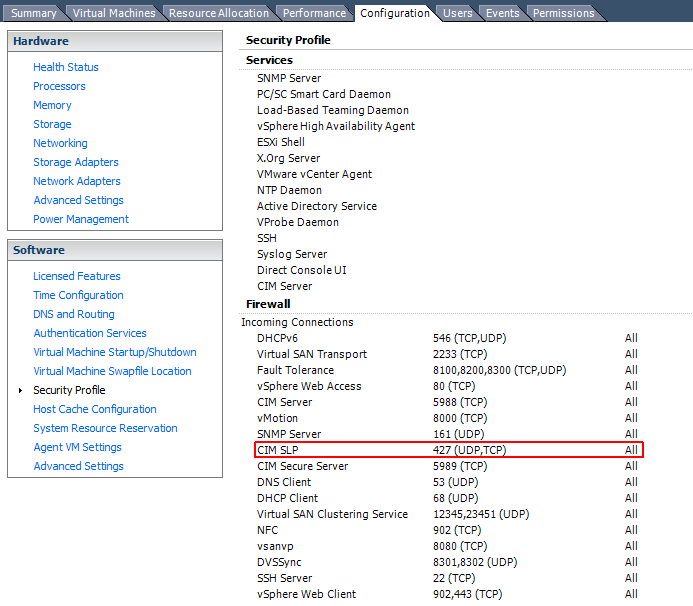 The SLP daemon is running on each ESXi Host listening on Port 427 TCP/UDP. According to KB1012382 it is required for the communication between the vSphere Client and the ESXi. What can I do with SLP? We have a strict change process and I want to Install the Security Patch only. Is that possible? Can I stop or block SLP to mitigate the Problem? I've used tcpdump to see how often the service is queried during "administration tasks". There were no packets. Interesting inputs, thanks. Now that we're a full year after that text was written, any news on the service stopping or port blocking ? Did you get through some issues because of it, or can it be considered an acceptable workaround ?